Yesterday Apple unveiled OSX Yosemite, and it made some goods, some bad, and some ugly changes you should know about. It won’t be available to the general public until the fall, and it’s in beta, so changes will be made, but you probably still want to hear my first impressions after day one. OSX 10.10 got a design overhaul by Jony Ive, Apple’s chief designer, and those changes are noticeable. The layout of the user interface is the same, but within that layout, major changes have been made. The system font – the font for all Apple applications, and menus, has been Lucida Grande for a decade. This time, Apple switched it to a version of Helvetica Neue, which is a very popular modern font. I wouldn’t say it’s less readable than the old font, but I don’t really see any benefits from the new font. For me, it will take some getting used to. Icon, and dock colors saw a major overhaul. As one of my friends put it, “they’re more cartoony”. They’re bright, vibrant, and clean. Overall, it’s a nice change. I especially enjoyed the new Finder icon (displayed below). Gradients, and “shininess”, which pervaded the previous operating system, have been replaced by smooth, matte colors, which give the computer a decidedly modern feel. For some reason, by the way, the system’s version of the color black, looks a lot more black, and has a higher contrast. I don’t know why. Yosemite also makes wide use of translucency (although they call it transparency), to give the feeling of modernity. For example, windows are slightly translucent, so that you can see the colors behind them on the screen. Some may like this, but I found it distracting, and that it made reading more difficult. Luckily, for those who agree with me, there is a setting in accessibility that allows for the disabling of transparency. I’m using it, and it works perfectly. The new dock makes use of translucency to give the feeling of brushed glass. It’s really easy to see icons in it, and I personally think it looks beautiful. As I said before, I love the newly designed app icons. The iconography on the menu bar, I’m not such a fan of. They made the lines in the Wifi signal thinner, which made it significantly harder to read. Most everything else is Ok, but not being able to read Wifi signals is a serious issue for me. Perhaps my favorite feature that I’ve used so far is the updated spotlight. The design is incredibly clean, and I’m impressed by what it offers. 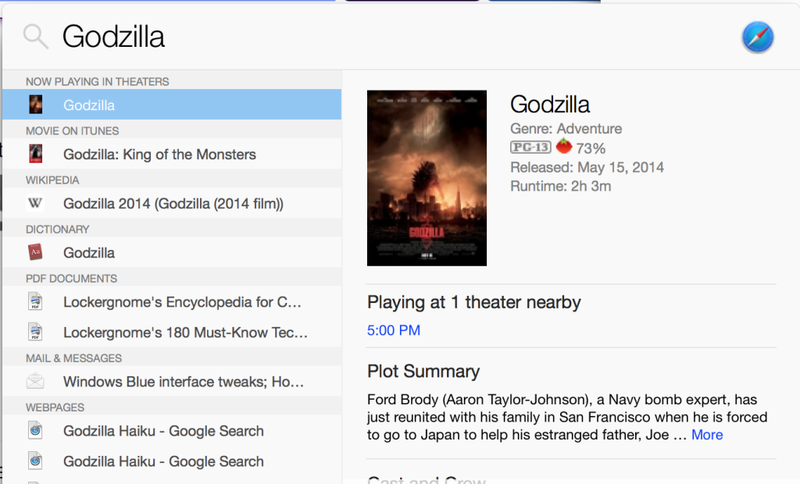 For those of you that don’t know, Spotlight is Apple’s tool for searching your computer, but it is now capable of search things like iTunes, movie showtimes, and Wikipedia. I’m seriously in love with it. I haven’t downloaded iOS 8 yet, because I have to back up my phone first, but in Yosemite, the new messages app is powerful on its own. The interface is very clean for a messaging app, and everything from managing groups, to sending texts and voice messages, seems to work very well. It’s also worth mentioning that despite the upgraded operating system, I’ve experienced no slowdown, or loss in battery life. Overall, I’m very happy with Yosemite so far. There are a few design choices that I’m not thrilled with, but the new capabilities added to my computer make Yosemite an upgrade worth doing (although for now, you’ll probably have to wait a few months).